In this post I discuss the Connecting: participating on the web thread of the web literacy map from Mozilla. I’ve written further posts to cover the other threads Building and Exploring. This is all to earn the Web Literacy Ninja badge. I’ve broken it down in to the different section to ease the ‘marking’. I regularly use wiki pages on KnowHow NonProfit to share new information amongst the community on that website. Here is an example wiki a colleague and I have used to share a case study. There is a separate tab for the audit trail of changes and one also where comments can be left. Here is an example of a wiki based how to guide that I started on KnowHow NonProfit which has been (so far) edited by two other people. The 40,000 strong user community on this site can update this guide over time when new best practice information becomes available. I use lots of tools like Google Drive, Basecamp and Yammer to collaborate with other people in different locations. I push various RSS feeds around websites I manage in my day job through Twitterfeed to autopost to my twitter account keeping both myself and my followers up to date with new information from those websites. As part of my day job I took part in synchronous (as part of a live discussion) and asynchronous discussions on the Big Assist website. The aim of these forums is to encourage charities to share knowledge and expertise with each other. I am the main admin for this site and regularly take part in these forums, tailoring my language accordingly. Social media sites in particular can have fairly sketchy user agreements which may on the surface give power of content ownership to the users but often there are caveats meaning the platforms can use the user content any way they see fit. 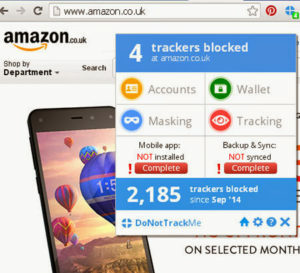 I use DoNotTrackMe to block attempts to track my movement on the web. This includes an email mask which I can set to mask my email address when I use it online. I use virus checkers like Symantec (amongst others) on my PC to scan emails and documents before I download, install or open them. During my day job I have led the implementation of a centralised web user database with Mozilla Persona on the front end of four websites – users can access their information on all four websites with only one log-in. The websites are NCVO, KnowHow NonProfit, European Funding Network and Big Assist. Persona is a great option for this because of the anonymity it offers the user. Other popular ‘sign in with’ services (Facebook, Google etc) shove personal data back to the host services making things not very private at all. On a side note I think it’s such a shame Persona hasn’t been adopted more widely. I’ve already got the open practices badge and I think the blog post I wrote to earn it shows I meet this criteria.